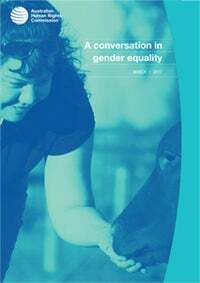 A conversation in gender equality shares some of the common themes that emerged during the Commissioner’s consultations with more 1,000 people from every state and territory in Australia. The consultations focused on engaging with people from a diverse range of communities and with a variety of life experiences. “Too often we look at gender equality through a single lens, as if all women have the same lived experiences,” Commissioner Kate Jenkins explained. The new report was launched on International Women's Day - 8 March 2017.